Nearing the end and I find myself facing west, facing home. 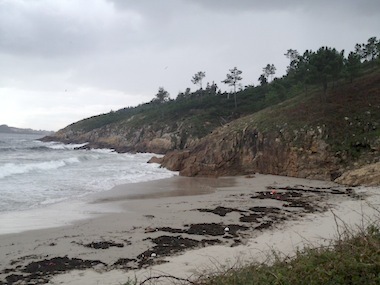 I dropped down off the trail just shy of Finistere to rest in this quiet cove. I came across so much beach plastic debris and felt my heart breaking. I don’t recall this even as recently as 2010, when I was last here. I took many pictures to record what I saw here on the coast and to save my last memories of the walk. Here I met a fellow perrigrino (pilgrim) resting on the rocks, watching me with curiosity. I learned that this was Harry from Austria and that it was his fist view of the ocean. I sat down and explained my project to him. He shared his firewater whiskey with me and we became instant bf’s. We decided to join together as we began our walk of the final stage of the camino; a long walk up the beach. Along the way we stripped down to our undies and jumped into the Atlantic. Harry quickly learned how to duck under a wave. After we found an alburgue we took a quick shower before our final step of our pilgrimage, ending at the lighthouse. Here pilgrims traditionally burn their shoes. It was nice sharing the my last night on The Camino with Harry. Instead of burning our shoes we drank firewater as we watched the sun slowly set in the west. The West. 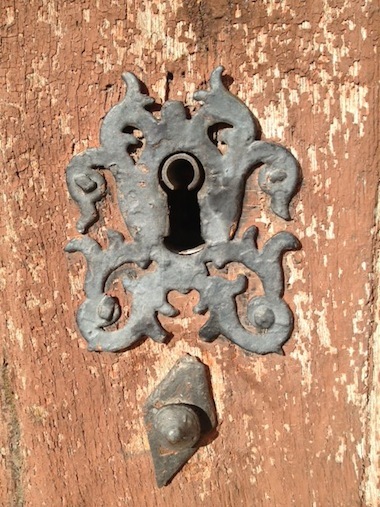 My thoughts again are leaning toward home; my heart open in recognition and joy. A picture is worth a thousand words. I often hear concerns about alternative to plastics. Our mothers and grandmothers did not have plastic wrap and we inherited a clean ocean. It has not taken long to get us to this state of affairs. As to that little package – I did share and each one of those little pastries was a delight. Hanh Nguyen playing “Suite del Recuerdo” 4th and 5th Movements. Freddie organizes classical and classical Spanish guitar concerts at churches throughout the region. He has a growing selection of performances on the YouTube channel for Camino Artes. Enjoy! 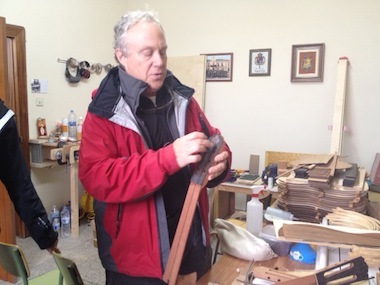 Camino Artes founder, Frederick Sheppard builds beautiful Spanish classical guitars in Carrion de Los Condes. He also teaches guitar building and organizes classical guitar concerts in the churches. He founded Camino Artes to provide accommodations for creative people needing a place in Spain while continuing artistic studies or to use as a studio residence. Artist working in any medium are welcome. Carrion de Los Arcos is located at the halfway point across The Camino. Freddy offers artists an opportunity to engage more deeply with Spain and specifically this region of Spain. He has a deep love for this area and hopes to popularize this region and encourage its economic well-being.